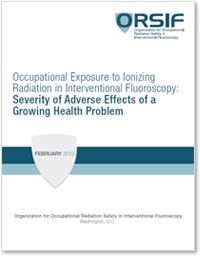 The Organization for Occupational Radiation Safety in Interventional Fluoroscopy (ORSIF) raises awareness of the health risks of occupational ionizing radiation exposures and associated musculoskeletal risks occurring in interventional fluoroscopy laboratories. ORSIF develops support for medical professionals and hospitals for new and better ways to create the safest possible work environment for those dedicated to the wellness of others. ORSIF is composed of members from industry and will expand to include physicians and staff from interventional fluoroscopy labs and will partner with other physician associations, academic institutions, labor groups, and government bodies.